Hilda and the Midnight Giant by Luke Pearson. Nobrow Press, 2012. Currently available. Face Value: Such an enchanting cover. There’s magic in this image. Hilda is a quirky looking little girl, and her eyes tell us that she’s discovered something amazing. This cover was so intriguing that it motivated me to track down a copy of the book. Does it break the slate? Yes. Hilda has the gift of being young, and her youth and open-minded nature allow her to see the right solution in a tough situation – even though it’s not a solution that is easy for her. She is feisty yet compassionate, which is a really nice blend of character traits. I see a lot of Slatebreaking girl characters who are admirably bold, but they are often so caught up in their own forward movement that they overlook the feelings of others. Hilda is the antidote to that. Hilda connects with those around her, even if they have little in common. Who would we give it to? If you know any girls who have active imaginations, and maybe even invisible friends, this is a great book for them. It’s the perfect book to read inside of a blanket fort by flashlight. Review: Hilda and her mother live in a delightfully secluded valley and treasure their idyllic home. It is a great upset to their lives when they begin to experience vandalism and bullying from their neighbors – their tiny, invisible neighbors. Hilda’s mom considers moving out of their beloved home when she receives a job offer in the big city. Reluctant to leave the home that she loves, Hilda gets creative and tries to find reasons why she and her mom can stay where they are. Hilda lives in a world that is a little bit supernatural. It is a fantasy world where there are tiny invisible elvish-type beings, as well as giants, and a whole other menagerie of unusual beings. Other than the population of fantastical creatures, however, the world operates in a way very similar to our own. Bureaucracy clogs up the pipeline of progress and adults say things that they don’t mean to get what they want. Hilda doesn’t understand why everything has to be so complicated. She just wants to enjoy the beauty of the world and make sure that the other beings in her neighborhood are content, too. Because Hilda is willing to talk to anyone or anything, she makes some friendships that help her as she explores her little valley. She meets one of the invisible beings and signs a form that allows her to see them all – and she learns that her house is blocking major developments in their tiny city. I loved how Pearson illustrated Hilda’s ability to see what the other humans could not. It reminded me of a grander metaphor – that children can often see the things that we adults cannot because our vision has been clouded by years of disappointment and mistrust. Hilda can see past all of that, and her awareness of other people’s needs grows exponentially. She gets that she can’t always have what she wants, especially if her desires are less important than the greater good. I love that Hilda has this level of civic awareness, even as a very young girl. 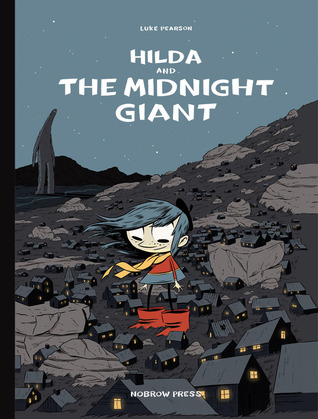 I am sure that everyone who has reviewed this book has said this, but it bears repeating: anyone who likes the work of Miyazaki will totally dig Hilda and the Midnight Giants. Pearson seems to be just getting started in this simple yet charming adventure. There will be more Hilda books on the way, and I hope to see her character grow in awareness and nuance. She already shows signs of greatness through her empathy and emotional intelligence. I suspect Hilda has some more adventures coming, and I will definitely be reading along as she embarks on her journeys. This entry was posted in Graphic Novels, Middle Grade, Reviews and tagged elves, Fantasy, giants, Graphic Novel, imagination, Miyazaki, quests. Bookmark the permalink.